Do You Get To Know Your Patients’ Stories? I was watching Master Chef on TV last week and I noticed a real theme happening. Each contestant had a life story as well as their skill to cook a magnificent dish. Listening to the stories of the contestants started to really pull on my heartstrings. I know the show is about cooking and a competition to see who cooks the best and who the winner is, but knowing something quite personal about each contestant gave me a real connection with them. I felt like I sort of knew these people and could relate to many of their stories. It made me now feel like I wanted to part of their cooking journey. The connection I now had with the Master Chef contestants made me feel, as my son Thomas put it, invested in these people. This is exactly what we need to do when people call our Dental Office. Start having a sincere interest in the callers. Start the wheels of connection going and start building relationships with your callers even before they have made the appointment and before they become your patients. Find out what the callers’ stories are. Start believing that every caller is going to be a patient. Get to know them and you will find immediately that the caller will feel comfortable and at ease with you on the phone and be more likely to trust you and make an appointment. 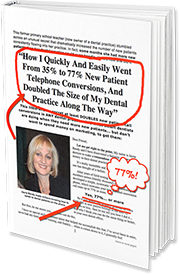 This one thing will set you apart from other Dental Offices. When you become seriously interested in helping your callers the result will be that more and more of them will become your patients for a long time.